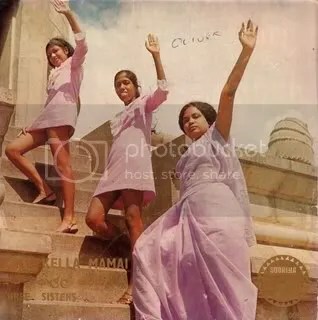 Three Sisters are Sinhala pop music from Sri Lanka. Someone who posted a bunch of their songs on youtube, wrote this short biography. Mallika, Indrani and Iranganie Perera were born to a musical family. Their mother was an accomplished pianist and a singer and though the father did not play any instruments, he loved music and was a close associate of Mohammed Ghouze, famously known as Ghouse Master. Mallika was actively involved in school variety shows at Presbyterian Girl’s School where she and Iranganie studied. Indrani later went to Stafford Ladies. Indrani’s first public encounter was a recording for school at the Radio Ceylon. Her talent was spotted by the school’s music teacher Mrs. Potgar and encouraged by the principal Mrs. Liyanage. Mallika later attended Amaradeva’s music classes held at YMBA and Indrani used to accompany her and practiced her singing outside the class. The girls had a difficult time when their beloved mother died of cancer, and Iranganie was only six at the time. Mallika took over the responsibility, left school and started to look after the two younger sisters, which created a strong bond between the father and the three sisters. Indrani was selected by Dalrene as a backing singer in her band ‘Fire Flies’. Later in 1969, Indrani Joined Annesley with Moonstones and sang her first song ‘Dilhani’ which became an instant hit. This was followed by ‘Sigiriya’ and a number of other hits. Girls’s father gave his fullest support and gave the idea of the girls forming their own band. On the 31st December 1969, they had their first performance at the Hotel Taprobane (now called Grand Orient Hotel – GOH). They had an excellent response for songs Kalu Kella Mamai and Akkala Nangila. 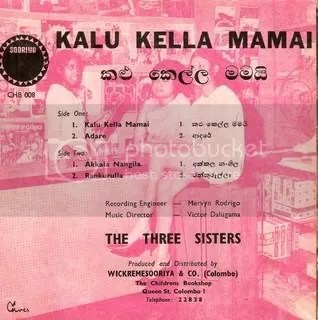 The three sisters continued to make fabulous music for over 20 years until Mallika’s untimely death by cancer. It was not then viable for the remaining two sisters to continue under the name of Three Sisters. Indrani later embarked on a successful solo career. This 45 and the other one that I bought that day are both on Sooriya Records as is the only LP that I own from Sri Lanka. The lead in this song is sung by Mallika. You are currently browsing the Backroom blog archives for September, 2009.